The fit of boots and shoes is a hard thing to quantify, but we give it a shot by just trying on a few pair and seeing how they compare to other brands we sell. My impression was that this boot is a “D” or medium width and the length is generally true to the stated size. A rugged boot like this is sometimes overly roomy where your foot might “rattle around” inside, but I thought these boots fit very well. The calf part of the boot is somewhat adjustable with the side buckles… +/- about 1/2 inch, which for a calf measurement is quite a lot. I have average-to-larger calf sizes and the boots fit me just fine in the middle position, so with the adjustment, I think they will fit almost anybody. 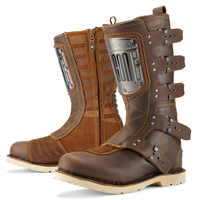 In 2012 Icon came out with the Elsinore boot. And now for 2016 we have the Elsinore HP. What’s new? Well the HP version adds a steel shin plate rather than the reinforced leather on the Elsinore, and the boots now have CE certification. I really don’t see any difference in the protections system… maybe they are changed slightly, but believe me… these boots will provide street riders with protection, certifications not withstanding! The leather is very thick and although they’ll take some break-in to be completely comfortable, the quality is there. And the looks are amazing. I remain impressed that Icon can offer this boot for the asking price. The full zipper arrangement is a godsend… imagine if you had to unbuckle all that hardware every day, but with the zipper, it’s all too easy… just set the buckles and forget them… easy-on and easy-off. The soles are very rugged and have an internal shank. The toe box and heel are reinforced and there is a firm shin plate… steel over the shin. If you take the “View Larger Images” link above you can check out the height of the tops and sole. Also shown is the function of the side zipper and there is also seen one of the two ankle bone protectors built in (the outside one is hidden between the leather and inner liner, but it is there! ).